In 1993, DC was in a bind. Despite being one of the most popular superheroes in the world, sales for the various comics featuring Superman were starting to slow down. The writers, who had already planned out a series of stories telling the wedding of Clark Kent and Lois Lane, were ordered to put that on hold thanks to the Lois and Clark television series. They were out of ideas. One writer then suggested that they just kill off Superman, which was a running gag between them. This “joke” soon became a serious matter as they all decided to push through with it. This launched the Death of Superman storyline, which eventually made headlines all over the world and led to DC selling a boatload of Superman comics then. Coincidentally, it seems like DC is trying to strike it rich again… by killing off the Man of Steel once again. That’s because they recently released The Death of Superman in their new DC Animated Movie Universe. Although this film is based on a story that was already told around 25 years ago and, yes, DC already released Superman: Doomsday, which is generally a retelling of The Death of Superman, they did see fit to alter some bits of the story as it is set in the DC Animated Movie Universe. As such, this review will be a SPOILER FREE review. The Death of Superman still follows the general plot of the comic storyline. Doomsday, a seemingly mindless monster, arrives on Earth and starts wrecking havoc. Most of the DC superheroes try to take Doomsday down but they’re simply no match for the creature’s strength and ferocity. It appears that the only one strong and tough enough to take down the monster is Superman, leading to a brawl that may be the final battle for the Last Son of Krypton. As I mentioned earlier, they did make some adjustments to the original story to make it fit into the DC Animated Universe better. 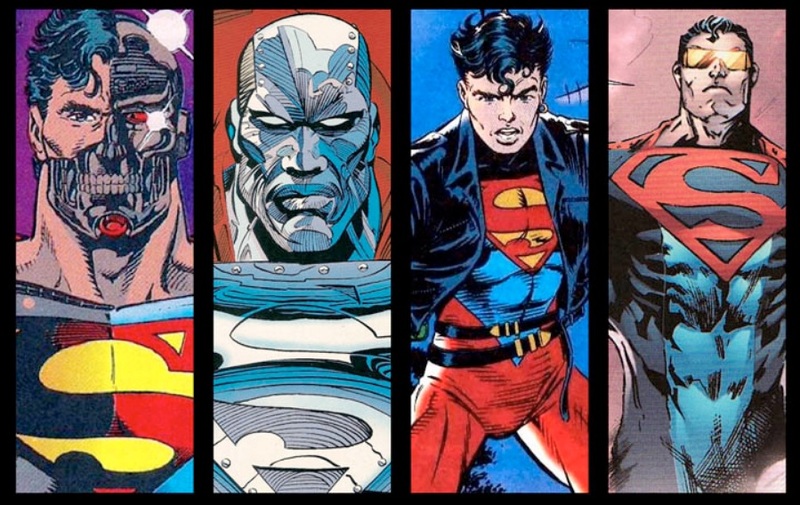 Instead of facing off against the (more comical) Justice League International before Superman, Doomsday faces off against the more “traditional” Justice League that features the likes of Batman, The Flash, Green Lantern, Cyborg, Aquaman, Wonder Woman and others. After all, this is the Justice League that started in the Justice League: War and Throne of Atlantis continuity. This is definitely a much better team and it does make Doomsday feel like a force to be reckoned with. In fact, I will say the best parts of the film are the ones that involve Doomsday. I never really liked the design of Doomsday in the comics and I can’t really say the same thing here in the animated version of The Death of Superman. However, I will commend DC for allowing Doomsday to actually show him killing off some police and even innocent civilians in a somewhat brutal and bloody manner. The fights and action scenes that involve Doomsday are really well animated and the sequences seem really well planned most of the time. The film does take a while to get into it as roughly the first third of this 81-minute animated film isn’t that interesting, unfortunately. Oh, it’s important to the grand scheme of things as it involves Superman and Clark Kent’s budding relationship with Lois Lane as well as Lex Luthor’s disdain for The Man of Steel. The problem is that I didn’t care all that much as if felt shoehorned in but they had to include it as these elements are the emotional crux of the story. Remember: The Death of Superman is the 11th entry in the DC Animated Movie Universe continuity and they hardly showed Lois Lane or Lex Luthor before this. In fact, prior to The Death of Superman, specifically in Throne of Atlantis, Superman was in a relationship with Wonder Woman! They do explain what happened but they just do so in passing. You would think the folks overseeing the DC Animated Movie Universe would’ve devoted a few scenes in the previous films to show it. Instead, we just have them give a few minutes of exposition explaining what happened. It certainly didn’t help that both the actors that do the voices of Lois Land and Lex Luthor pull off very unconvincing performances. I was actually surprised they were voiced by Rebecca Romijn and Rainn Wilson, respectively, as they are competent actors. But in The Death of Superman, they just sound bored and emotionless most of the time. Their delivery is mostly flat and uninspired. Thankfully, the rest of the voice cast does a decent job. Jerry O’Connell does a great job of conveying the rather “boy scout-ish” nature of Superman, but he does need a little work in making his Clark Kent sound different from his Superman. Nathan Fillion and Christopher Gorham take on the roles of Green Lantern/Hal Jordan and The Flash/Barry Allen, respectively, and I really liked their delivery, despite only having a few lines of dialogue. Jason O’Mara appears to be the default Batman in the DC Animated Movie Universe and, while he’s no Kevin Conroy, he has definitely made the role his own. The best performance, however, comes from Rosario Dawson as Wonder Woman. She gives the most energetic and strong, which is perfect for a warrior princess like Wonder Woman. 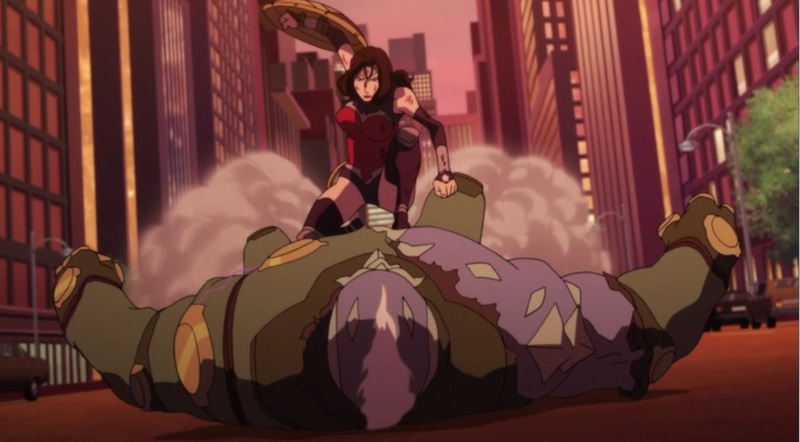 She has to be tough if she has to fight Doomsday! The art and animation is kind of a mix bag. As I mentioned earlier, the action scenes look really good and that’s generally because they’re so well animated. They also use some really clever camera angles, such as close ups and wide shots to give the viewers the best angle of the fight. The problem comes with the slower moments and dramatic moments as everything looks so still and empty. There are times when the Daily Planet doesn’t look like a busy news office but rather a newly condemned building as there is hardly anyone in there. When the characters have a conversation with each other, it feels like they hardly move around at all. It’s such a shift from the dynamic animations from the action sequences and it just doesn’t look good. Another complaint I have with The Death of Superman is a general problem I have with the current live-action DC Extended Universe. That is them adding elements for future films. Sure, they did this in previous DC Animated Movie entries before, but they take it to the next level here! All of a sudden, they just introduce a bunch of new characters and elements from out of nowhere. Comic book fans will know who and what they are but their introductions here feel so artificial and, honestly, rather needless as they can simply introduce them in the next film and no one will really wonder who they are because their debuts here feel pointless. With all that being said, I actually liked this animated version of The Death of Superman because, once we get passed all the non-action scenes, which generally take the bulk of the first half of the film, things get really good. The second half is just a glorious beatdown with escalating property damage and casualties. Doomsday feels really like an unstoppable force of nature and there are times when it seems like even Superman won’t be able to take him down. Sure, it gratuitous but it’s what I would expect from a movie that says that Superman might die at the end. Overall, I can safely recommend The Death of Superman as something that is worth a watch. The first half may be a little boring but when Doomsday arrives on the scene, things heat up really quickly and the final battle is a thing of beauty. I just wish they put a little more care with the story leading up to the battle. Have you seen The Death of Superman? What did you think of it? Let me know in the comments section below!